Правда ли, что фотография на обложке альбома "Made In Japan" сделана не в Японии, а на летнем концерте 1972 года в лондонском клубе "Rainbow" ?
" ...The gig was in '72. Incidentally, the photograph on the cover of MIJ was taken at the Rainbow. 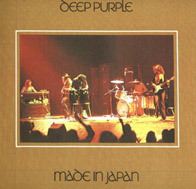 It was used because when we were doing the cover design there were no photographs available from Japan."